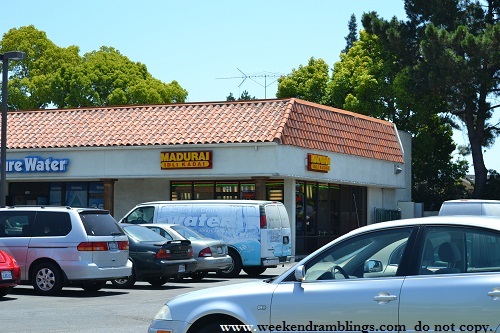 I am a die-hard dosa fan, and if you didn't know that about me already...well...err..okay..so you know that now :D :D Luckily for me this part of California is like a miniature version of South India - the Indian stores here stock chutneys and mixes I haven't seen in Bangalore. 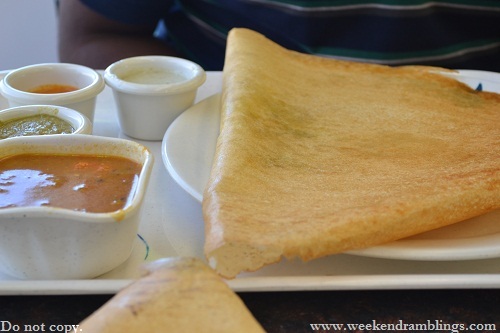 I also managed to find a shop that serves up the yummiest, tastiest, mom-would-approve dosas. I was watching the promos for Friends With Benefits the other day on TV and loved Mila Kunis' eye makeup. I checked a few photos online and decided on a brown eyeshadow with a plum-burgundy eyeshadow on the outer corner - and black liner along the upper lashline. Am sure she has a more complicated makeup, but this is all I am up to :) Disclaimer over. 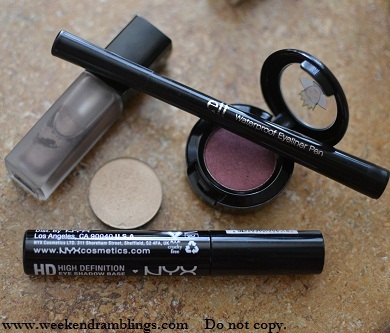 For the eyes: I used NYX HD eyeshadow base. Used Chanel Ombre D'Eau shadow Splash all over lid. 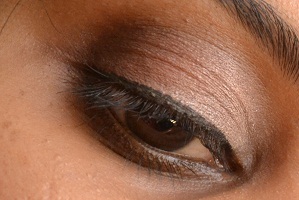 Used Inglot eyeshadow AMC Shine 30 for the inner corner. Used MAC Vainglorious eyeshadow to the outer corner and crease area. 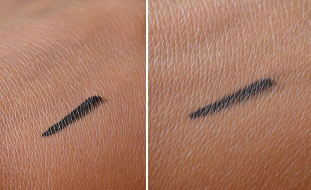 ELF liquid liner in black to the upper lashline and along the lower lashline. Finished with a coat of mascara - YSL Faux Cils Noir Radical. 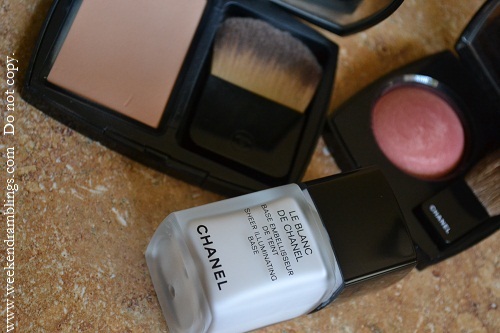 For the face: I used MAC Select Moisturecover dual concealer followed by Chanel's Le Blanc base. 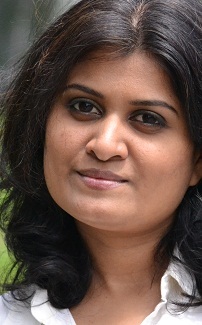 Used the Chanel Mat Lumiere powder foundation and Lakme's Kiss of a Rose blush. 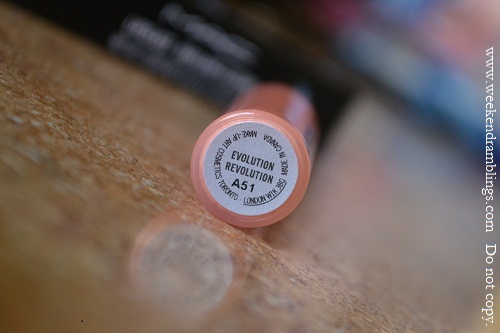 Lipstick - Maybelline Color Sensational My Mahogany. I spent the day chatting with my friend and did a bit of cooking (rajma). 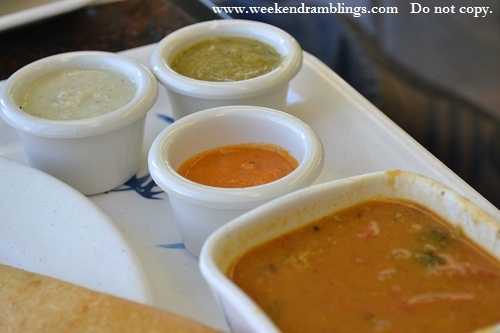 No plans for the weekend, but what about you - what's cooking over the weekend? 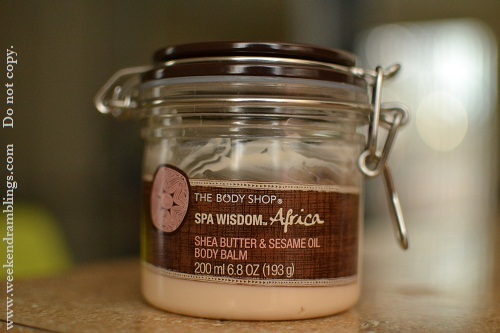 TBS Spa Wisdom Africa Shea Butter and Sesame Oil Body Balm - available HERE. Nourish and protect your skin from dryness with a rich, comforting and intensely moisturizing balm that will leave it feeling soft, velvety smooth and scented with our traditional Spa Wisdom™ Africa fragrance. 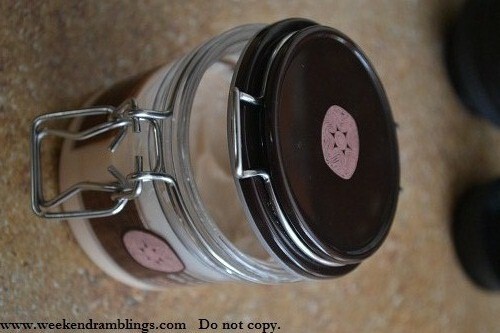 The Spa Wisdom range from TBS is one of my favorites, along with their fabulous body butters. 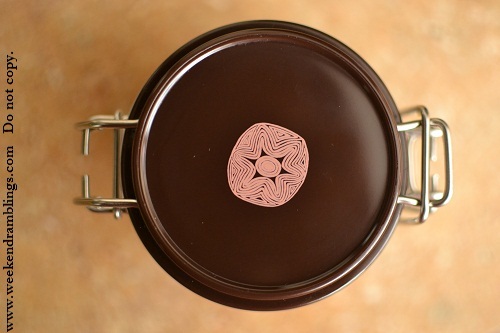 The African Shea Butter and Sesame Oil Body Balm seemed very similar to the body butters, but I have to confess, it is the packaging that caught my attention - the jar with the metal clasps is quite different from the usual tubs and tubes. The Spa Wisdom Africa Shea Butter and Sesame Oil Body Balm is a soft cream with an amazing but not overwhelming fragrance. 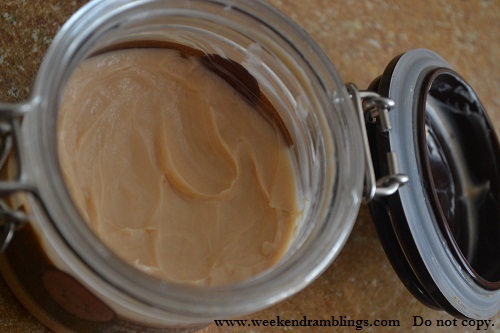 This pale peach-coloured cream is easy to spread and is very light and fast absorbing. I was expecting something thicker, like the usual TBS body butters, but this is much lighter and perhaps more suitable for the summers. While I love this product for the amazing smell and the light and effective moisturization it provides, I do have a few problems with it. I ordered this online from the TBS site, and there was some leakage around the rim of the tub. Apart from some wastage of the product, it also left the tub messy :( This might be something to consider if you intend traveling with the tub - absolutely essential to pack carefully in a separate plastic bag. This is after I cleaned up as best as I could - you can still see the dried bits along the rim. At $24.00/193 g (Rs. 1095 in India), this is also a very expensive product, and I doubt if I would ever pick it up at this price. I got it at a discount at one of the frequent TBS sales, and that's the only way I would buy this! A fabulous moisturizer, perfect for those looking for something between a body butter and a lotion, this is one of my favorites but definitely a sale-time purchase only. 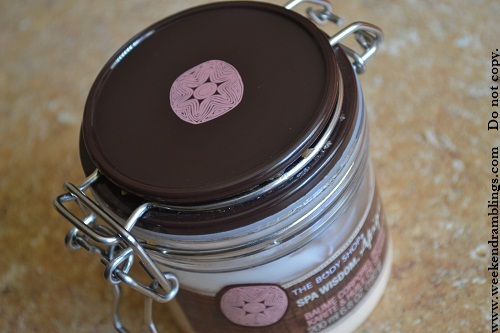 Have you tried any of the TBS Spa Wisdom products? Complete list of TBS product reviews check here. 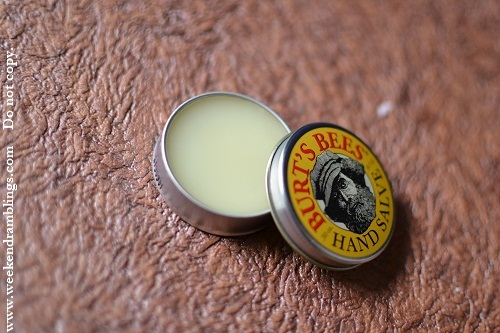 Our most intensive hand treatment, this formula is packed with botanical oils, herbs and beeswax to moisturize hard working, rough, dry hands. It's an everyday miracle. 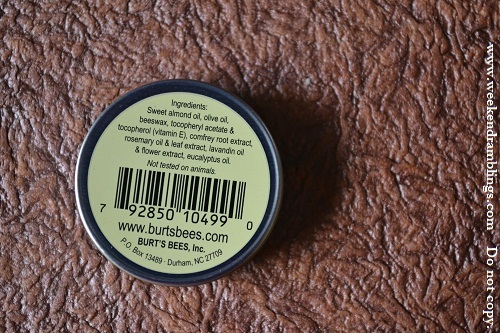 The Burt's Bees Hand Salve reminds me of a lip balm - it has the same waxy consistency and texture. The smell is a sharp smell - mix of citrusy and eucalyptus. I don't have a problem with the smell, but it might seem too strong/sharp for some. How to Use: For best results, gently massage the salve into skin daily before and after gardening and other outdoor activates. 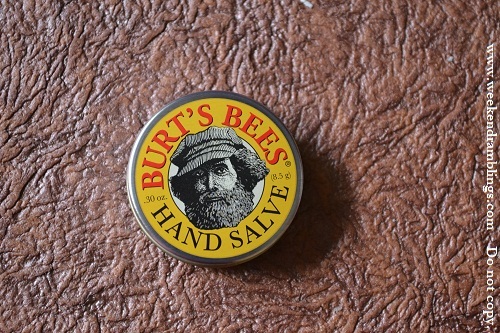 I scrape out a bit of the balm-like product on to my palm, rub to melt and spread the product on my hand. 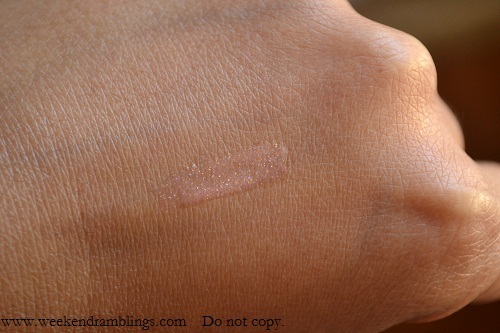 It has a very thin, light oily texture to it - goes on kind of like a thinner version of Vaseline. As instructed, the product needs to be massaged into the skin, and it takes a bit of time to get absorbed, but my hands do feel softer with it. Personally, I prefer creams, so I really couldn't get myself to like the consistency of this product. However, this is perfect for those who do a bit of gardening or any work that leaves hands very dry pretty soon - especially when used before starting the work. My hands aren't that dry any more, so I couldn't tell much of a difference with using this product, but I love using this as a night-time hand cream. It has a pretty impressive ingredient list, and I am happy with a little pampering for my hands :) Also, you need very little of the product as compared to regular creams. You have extremely dry hands - work outdoors, wash hands frequently, etc. You don't mind a strong-smelling product. Don't mind spending a bit of time massaging the product into the hands and don't mind the greasy hands for a while. If your hands aren't that dry, and if you are used to regular hand lotions, you would probably not like/need this product. Prep your eyelids with this lightweight eye makeup primer that evens skin tone, smooths lines and ensures lasting makeup application. The High Definition Eye Shadow Base alleviates creases and pumps up the vibrancy of your eye shadow. 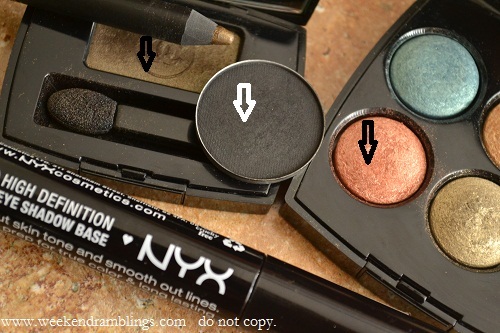 I bought this eyeshadow base along with a few NYX lipsticks from Cherry Culture a while back, and while I sent the lipsticks off to loving homes elsewhere, the eyeshadow base has been getting a lot of attention from me for a while now. 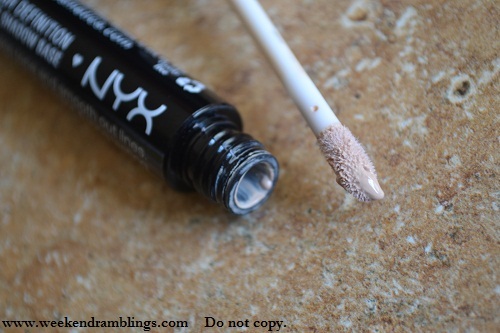 This is the first eyeshadow base/primer I am trying, so I really didn't know what to expect when I bought it, but now that I have used it for a while, here's my take on it. 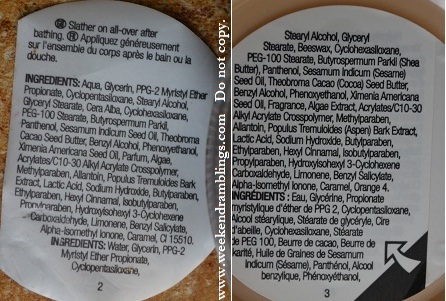 I have not blended the product. Once you blend it into your skin it's almost invisible. 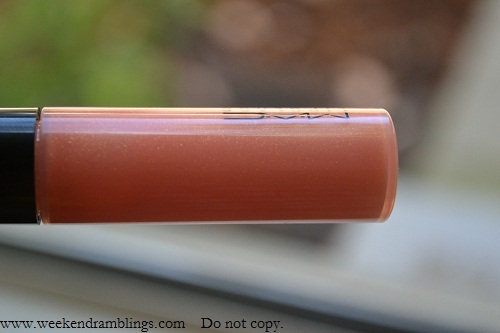 I have swatched a brown eyeshadow - L'Oreal HIP eyeshadow duo Dashing - doesn't show up much since it almost matches my skin colour without the base. On this base though, you can really see the difference.. Brings out the colour of the shadows. 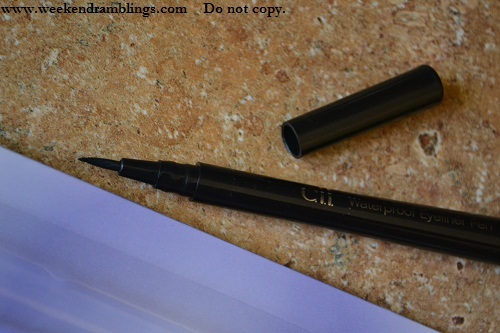 The eyeliner comes in a pen-type packaging with a snugly fitting cap that doesn't seem like it would come loose. 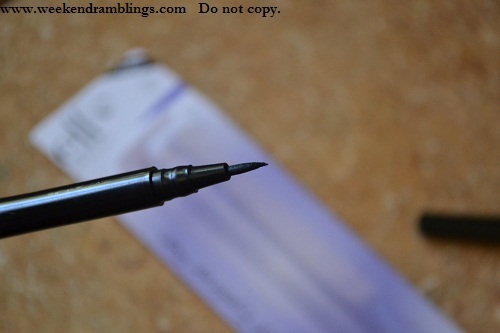 The felt tip dispenses the eyeliner and can draw thin or thick lines depending on your requirement. 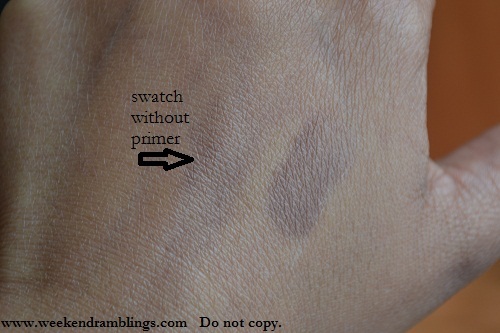 On my hand, it is very easy to swatch and is quite black and pigmented. 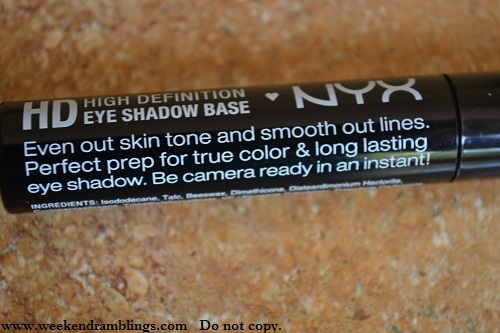 It dries very fast and true to it's claims the swatch is waterproof. I held my hand under water for some time and the swatch stayed on just as it was. 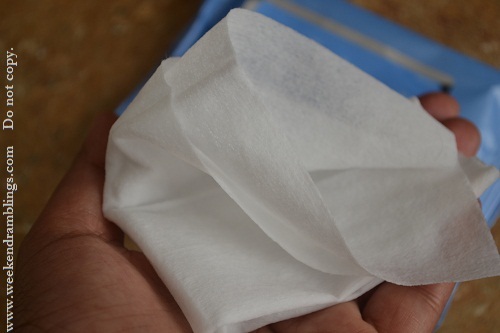 I tried rubbing the swatch with a towel and it got smudged slightly after that. L: Original swatch before water testing. 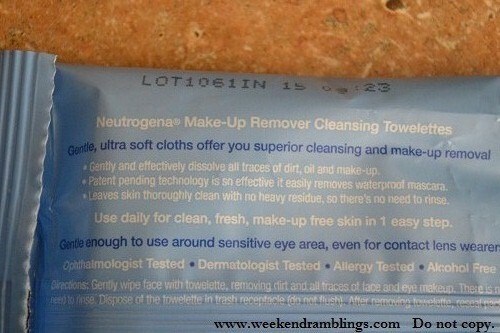 However while using it on my eyes, I didn't find it that easy to apply. The tip seemed a bit scratchy, and the colour didn't apply that smoothly. I don't know if it is because of my lack of experience with these kind of eyeliners or that's just how this is - either way I found it a little difficult to apply a thin line with this pen. I can't say I am very disappointed with it, but I would have liked it if it was a little more smooth in its application. 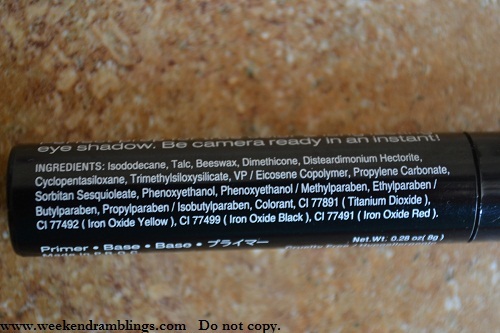 I tried using it on my waterline, but the colour didn't show up at all - didn't get applied at all - on the waterline. There was a bit of a grey tinge, and I only tried once and left it after that. The colour is just as black on my eyes as it is in the hand swatch, but I guess the sunlight was just too much and washed out the colour making it look less dark. 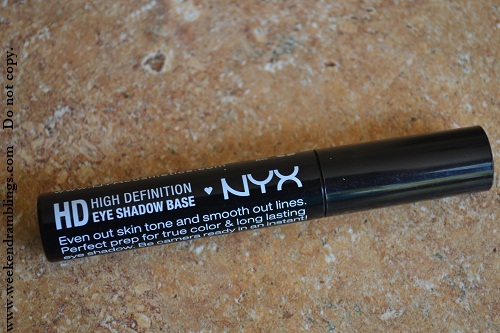 Overall, I find this to be a very decent eyeliner. I do wish ELF would do something about the scratchy applicator, but at the $1 price, I guess there is only so much I can complain about. 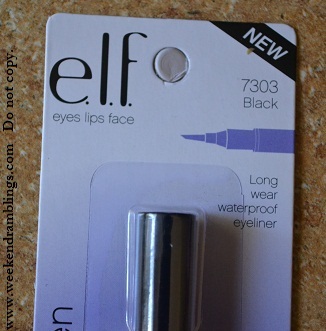 Have you tried ELF products? Which ones would you recommend? Boost your energy. 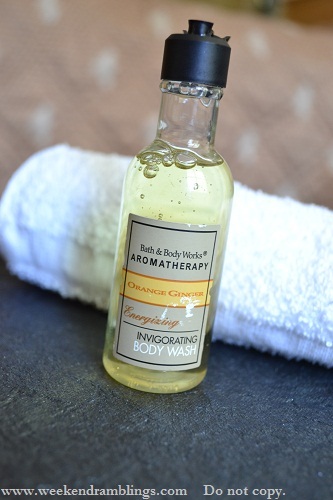 Orange Essential Oil refreshes and uplifts to relieve tension. Ginger Essential Oil stimulates the soul and sharpens the senses. This nourishing body wash contains Green Tea Extract to help keep sking looking younger and healthier. This is going to be quite an itsy-bitsy short review. 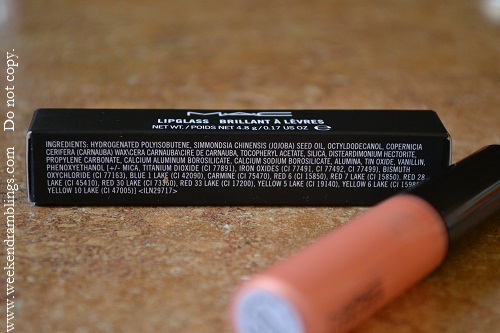 This was part of a travel set my sister got for me ages back, and I don't have the original packaging, so I cannot put up the ingredient list either. 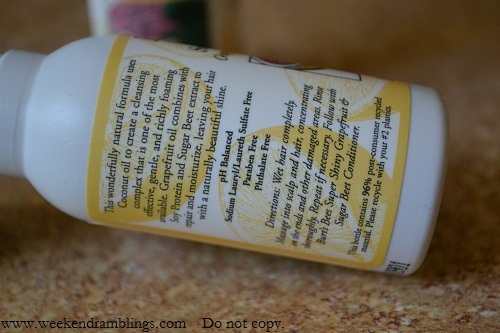 Anyway on to the bit of the review that I can do :D This is a clear, pale yellow body wash with a refreshing citrusy spicy smell. I just need to smell this and feel awake instantly. As recommended by Bath and Body Works, you need take a deep breath to get the best effect. Love it. The smell doesn't stay on the skin after a wash, though. I use it with The Body Shop bathing gloves to get supersmooth skin, and it washes off easily without leaving a slippery feel on my skin. While it doesn't dry my skin too much, I do have to follow this up with a moisturizer. 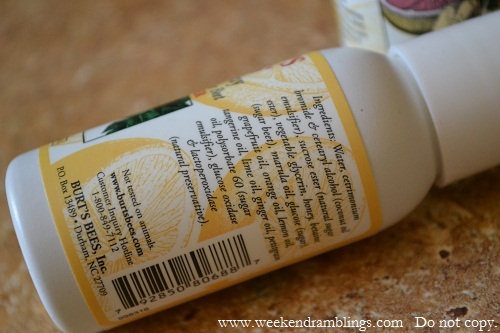 I generally love instantly refreshing citrus smells, so this body wash would definitely be a "love it" for me. Now that I have access to Bath and Body Works, I want to try other products, though. Which is your favorite product from Bath and Body Works? The title is a bit of a brainwave on my part. I am having one of those sleepy days, and my drowsy brain absolutely refuses to think of anything to post. 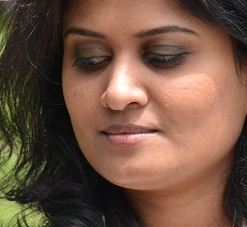 Compromise - I thought I will share the makeup I tried last weekend to go with the MAC Evolution Revolution lipglass. and Elle18 kajal on the waterline. Reddish-bronze (?) 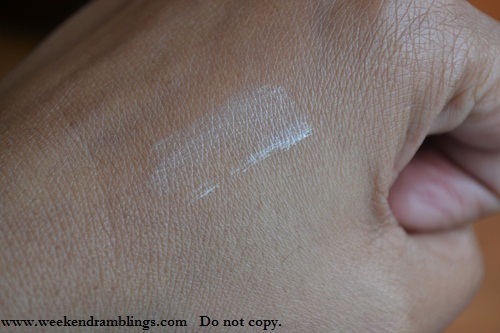 eyeshadow from Chanel's Bird of Paradise quad. Sweet and tart team up to turn up your shine. Essential Citrus Oils, featuring Grapefruit, are blended with gentle, plant-based cleansers to create a richly foaming shampoo. Betaine, made from Sugar Beets, penetrates to help repair damage for hair that feels healthier and looks shinier, naturally. The conditioner has essential Citrus Oils, featuring Grapefruit, are blended with Betaine, made from Sugar Beets, and Marula Oil to replenish, condition, soften and improve manageability. Hair feels healthier and looks shinier, naturally. 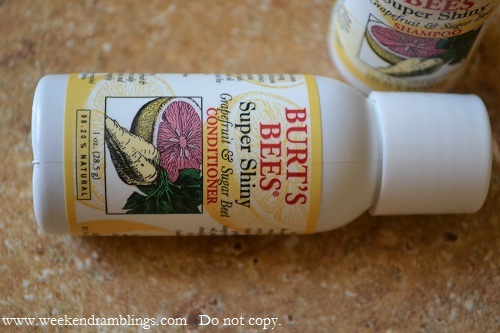 I got the Burt's Bees Super Shiny Grapefruit Shampoo and Conditioner as a part of the Burt's Bees Head to Toe Starter Kit - a great set for anyone wishing to try out a bunch of products without hurting the pocket. 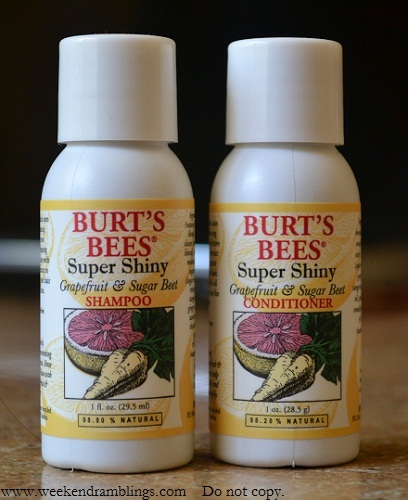 Both the shampoo and the conditioner have a citrusy smell and claim to provide supershiny hair. 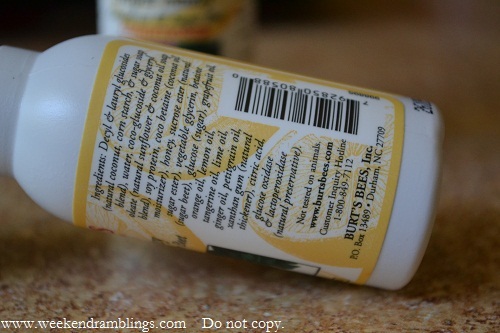 This is a clear, pale yellow shampoo with a strong citrus smell to it. 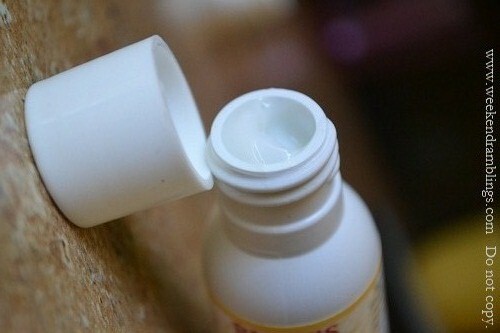 Though not really very mild, if your hair needs some extra cleaning or if it's very oily, you might need to use a bit more of this shampoo or maybe shampoo twice to get clean-feeling hair. 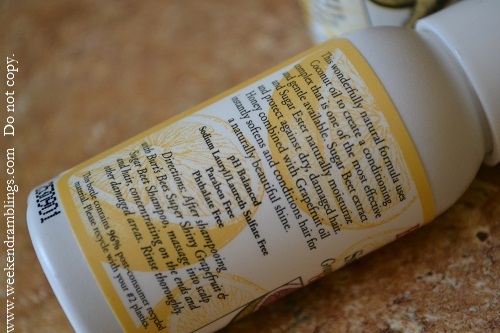 A thick, creamy white conditioner that is an absolute essential especially if you have just washed your hair with the Burt's Bees shampoo from the same range, this does what it claims and leaves hair shiny and soft. 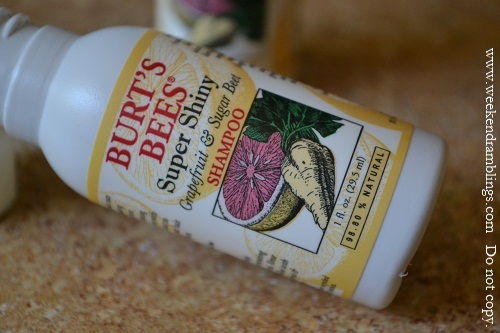 Overall, I loved the Burt's Bees Grapefruit and Sugar Beet haircare range. I love that they don't irritate my scalp and leave my hair feeling quite normal. I did not find my hair "supershiny" though - was no shinier than usual - but I haven't used it that many times to tell if it is a longterm effect :) I would definitely NOT use the shampoo WITHOUT the conditioner. 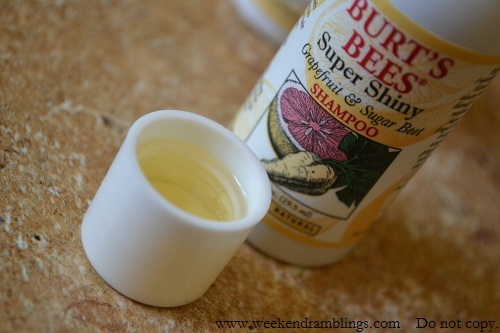 I never follow instructions on using products from the same range, but with the Grapefruit and Sugar Beet range at least, I would follow exactly what Burt's Bees suggests and use the shampoo with the conditioner from the same range. 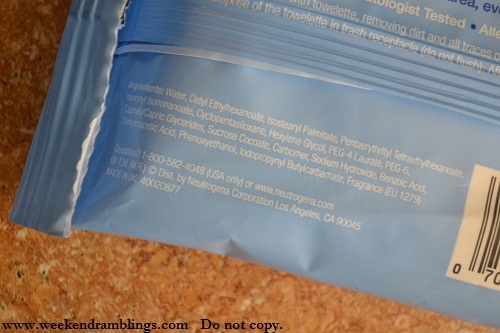 Cost: $8.00 (for regular size bottles of both the shampoo and conditioner - not what is shown in this review). I cannot pass off as a MAC-obsessed blogger, but I definitely admire MAC for the concept behind the Bloggers' Obsession collection. A group of bloggers were selected, and to thank them for their honest feedback and passionate devotion MAC invited them to custom create their own eyehadow or lipglass. Available exclusively online, just like the makeup-mad minds that invented them. 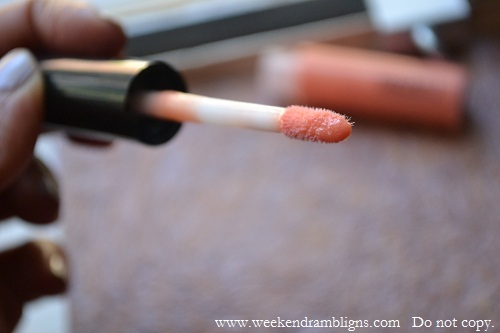 This is a pale peachy lipglass with a hint of pink in it and fine shimmer scattered throughout. The colour has a beautiful depth to it, and unlike the general trend with paler colours, this absolutely does not make me look washed out. It is sheer and with my pigmented lips, it is not the best idea to use it on its own - I used a lipliner similar to my lipcolour and topped with EvRev. 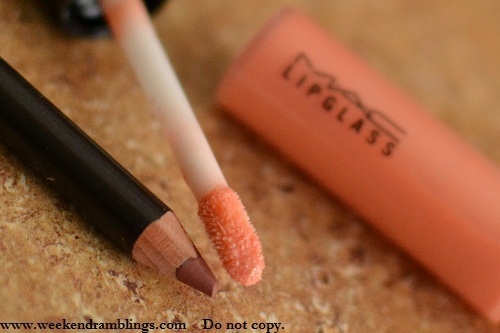 This is my first MAC lipglass, and I didn't know what to expect texturewise - love the nonsticky texture and the vanilla scent. That's me with the EvRev lipglass. 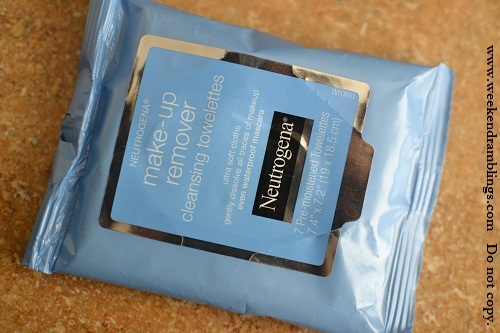 Verdict: I could only pick one product from this collection, and for me, this was the perfect choice. It is an easy to use colour and something I see myself using quite often. 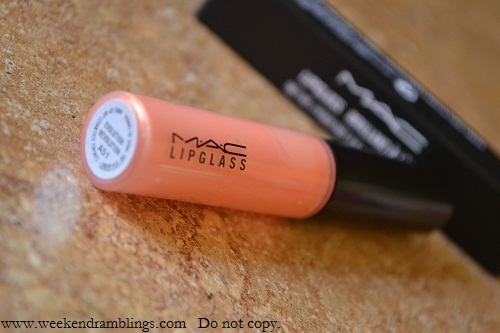 Cost: $14.50 (currently out of stock, but MAC might be restocking so sign up and stay informed).